School’s over, the kids are excited, and mum and dad are ready for a relaxing break –it’s time to pick a vacation destination. How about the beautiful island of Barbados? Every year thousands of families escape to its sunny beaches – and from amazing activities and all-inclusive resorts, to fun kid’s clubs and child-friendly restaurants, we know exactly why. Let us tell you the best bits that entice families to the island of Barbados every summer. Of course we can’t write about a family vacation in Barbados without talking about the beaches. Dover Beach is thriving with families enjoying the sun, with calm waters perfect for a lazy swim in between creating sand castles – or add a drop of adrenaline into the mix with fantastic jet skiing, boogie boarding and windsurfing. Accra Beach is a hot spot for families too, catering for younger and older children. For the little ones there’s a great pool-like area surrounded by rocks, sheltering them from any wild waves - so parents can rest easy knowing everyone will be safe. Meanwhile, older kids will love the thrill of Accra Beach’s water sports, including riding the waves on a Hobie Cat – a colorful sailing catamaran, before delving into a hearty lunch at one of the aromatic food stalls sitting on the boardwalk. Mullins Bay is a safe, sunny haven for families too, where the kids can choose to either enjoy a dip in the roped off areas, or venture further into the waves on a jet ski. Whilst the kids take to the water, the beach bar offers flavourful rum cocktails for the parents, or light snacks and lunches so families can spend the whole day taking in the beach’s tropical ambience. 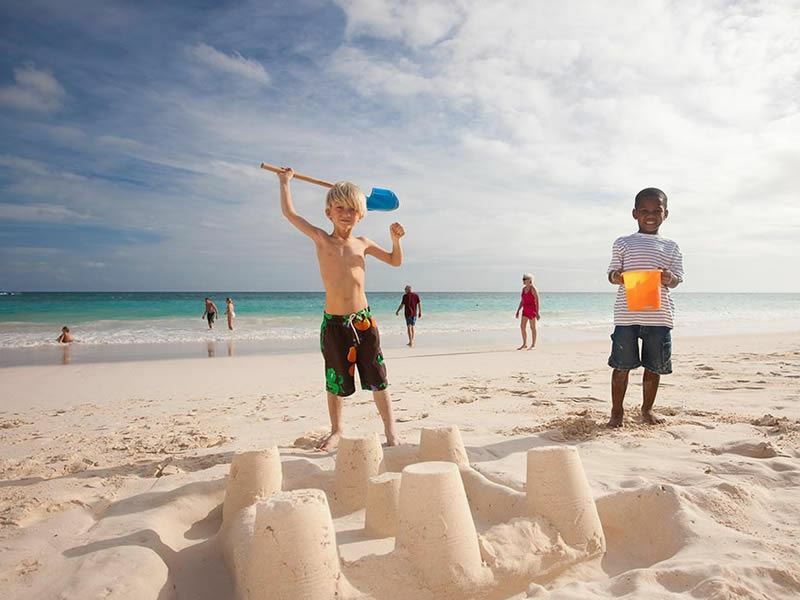 With a wide variety of beach activities, it’s no wonder the kids have such a fantastic time in Barbados. 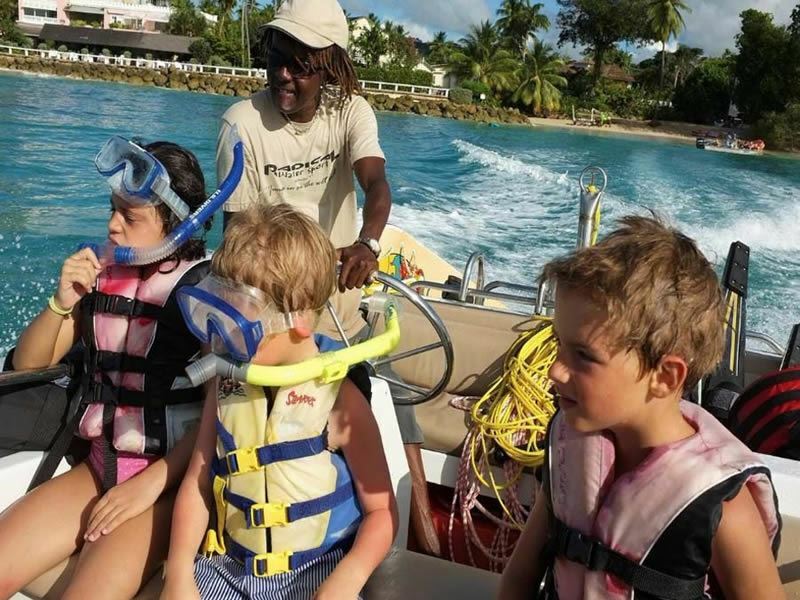 Sailing lessons, snorkelling, catamaran cruises, jet skiing and boogie boarding offer older kids a great adrenaline rush, whilst the little ones can dip into the calmer seas of the west coast as mum and dad soak in the sun. For a moment you won’t forget, swimming with turtles is a wonderful excursion where the family can get up-close to leatherback and hawksbill turtles, and learn about the conservation efforts made by the Barbados Sea Turtle Project. If the opportunity to see baby turtles hatch and make their first journey out to sea doesn’t convince you, we don’t know what will. Good weather all year round provides families with the ultimate choice – pack your suitcase for the summer vacations, or catch some winter sun over Christmas. Either way, you’ll be graced with great weather. The summer months can bring with it humidity, whilst the winter can suffer from wet weather – however, the average climate is sunny and warm, with a fresh Atlantic breeze to keep the temperatures manageable for younger children. An all-inclusive vacation is an excellent way to enjoy a stress-free family break – with everything sorted already, all guests need to do is enjoy the sunshine. Barbados is home to a variety of excellent all-inclusive resorts suitable for families, making sure there’s no worries as families play in the sand and relax on a sun lounger. 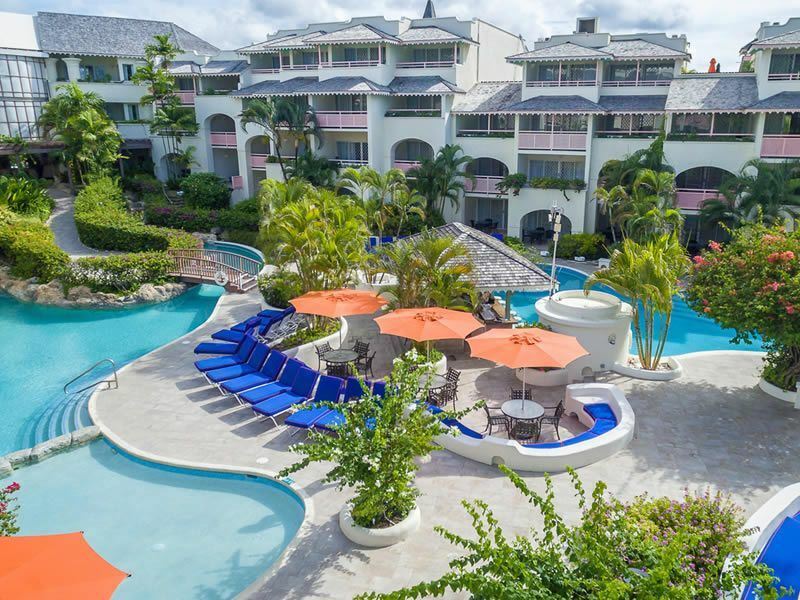 Boungainvillea Beach Resort offers absolutely everything a family needs and more, including complimentary snorkels, kayaks and boogie boards, as well as three awesome swimming pools, a golf course, and boutique shopping. Phew - what more could you want on a summer vacation? Barbados all-inclusive hotels boast fantastic deals for families too, allowing them to suit every budget. Take for instance Sea Breeze Beach Hotel, which offers a ‘kids stay free’ deal, with an outdoor and indoor kids club to keep younger guests entertained, and great children menus. With so many amazing all-inclusive hotels, it’s no wonder families are flocking here for a worry-free beach vacation. Parents are given the chance to relax in peace thanks to Barbados’ abundance of fun kids clubs. With a ton of cool activities, there’ll be no way the kids will get bored at the hotel. 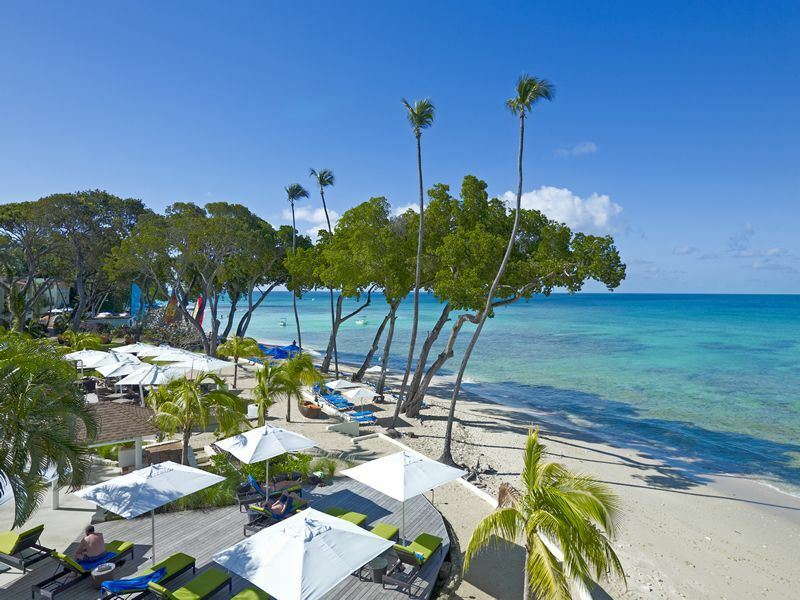 Turtle Beach by Elegant Hotels’ ‘The Flying Fish’ children’s club is fantastic; with table tennis, cricket and movie nights between 9am and 9pm for those under 12, or take the family to Cobblers Cove for sailing lessons, swimming with turtles, and creative arts and crafts. The kids will love it so much that they won’t want to leave. Whilst the children are having fun at the awesome kid’s clubs, parents are left to relax and enjoy the island for themselves. Barbados knows just how to treat mum and dad, with a variety of luxurious spas - including Sugar Cane Spa with its rejuvenating treatments, hydrotherapy and a relaxing dipping pool - and brilliant, sweeping golf courses dotted throughout the island. A free afternoon can be spent wandering through a plethora of shops and vibrant markets, looking for souvenirs and trying adventurous street food, or simply toast a happy vacation with a fruity rum-based cocktail. 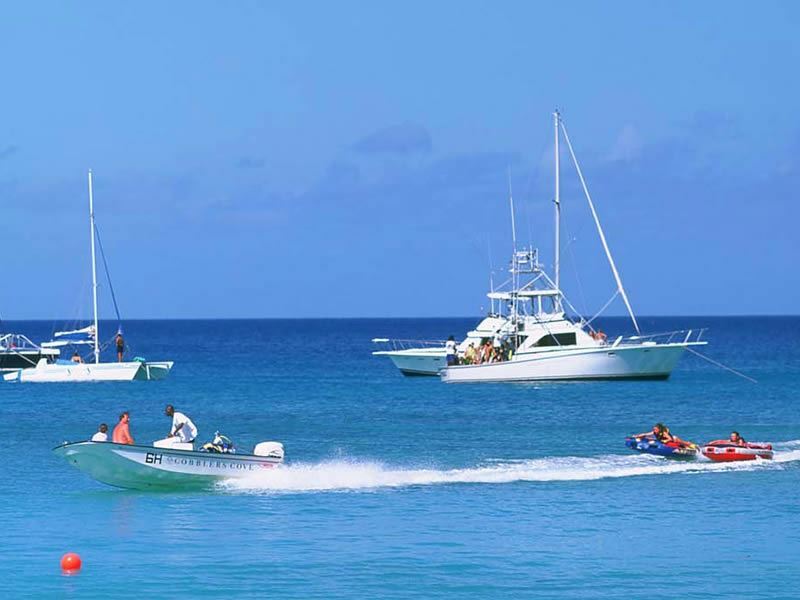 There are plenty of excursions the whole family will enjoy, and Barbados graces families with memories they’ll be talking about for a long time after. The Jolly Roger pirate ship is a barrel of fun, with swinging ropes and scenic views of the west coast of Barbados – just look out for pirates waiting for you to walk the plank. An exciting escapade all families love is the Atlantis Submarines Adventure, plunging you underwater to discover colorful marine wildlife and rusted, abandoned shipwrecks in either a day or night dive. Fancy a unique experience? Harrisons Cave is certainly alluring for adventurous families, journeying through a natural phenomenon and discovering icy stalagmites and emerald pools. The Wildlife Reserve is fantastic too, where families can marvel at wonderful wildlife as they eat, play and interact – think tortoises, birds, otters and deer – or the island is host to plenty of educational activities, including the Barbados Museum with its own special children’s gallery. Delicious food makes for a happy family, and Barbados is full of welcoming restaurants with fantastic children’s menus and Caribbean fare. There’s no squabbling over where to go with so many homely dishes to try, including Italian cuisine and hip beach BBQs. Wander along Silver Sands beach in search of a hidden gem called Surfer’s Bay - a picturesque, open-air restaurant with a glistening bonfire and simple dishes, including fish and chips. For ultimate comfort, Mama Mia Italian Deli and Pizzeria is a big hit with families with their tasty pizza and pasta options, and deliciously sweet gelato; or Fisherpond Great House offers a unique experience with its lush gardens full of birdlife. Also popular with families is Chefette, a chain restaurant with a fantastic, varied children’s menu and fun playgrounds at seven of the locations. Fancy a BBQ on the beach? The Chefette restaurants on the Rockley and Warren beaches have a rustic BBQ Barn that families will just love. With so many brilliant activities, indulgent all-inclusive resorts, beautiful beaches and all-year-round sun, it’s no wonder Barbados is so popular for family beach vacations.